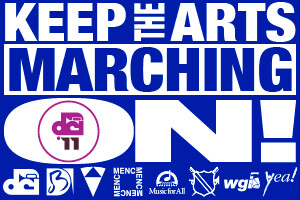 Dear Friends: We need your vote to Keep Music & the Performing Arts Marching ON! As you may be aware Drum Corps International, along with DCI-member organizations the Blue Devils, Glassmen, Santa Clara Vanguard and Cadets (through their parent organization Youth Education in the Arts) – as well as our strategic partners Music for All/Bands of America, MENC: The National Association for Music Education and WGI: Sport of the Arts – have advanced to the second round of an exciting program created by the JP Morgan Chase company which awards grants of up to $500,000 to deserving nonprofit corporations. Each of the eight groups have already received a $25,000 grant from Chase Community Giving as a result of the enthusiastic support of their legions of members, alumni, supporters and friends during the first round of the campaign. This is TRULY remarkable, and underscores the importance of performing arts education as a culturally-enriching and inspirational pursuit, with far-reaching benefits extending well beyond the performance stage or competition field. Our collective is faced with a TREMENDOUS opportunity here, and we need your assistance to create an even brighter future for the incredible young people we are privileged to serve. Our "Big Idea" for the use of a half million dollar grant centers upon investing in a series of initiatives and special projects which will immediately benefit our collective, their fans and supporters, and the drum corps activity at large, while serving as a catalyst for future growth. You can learn more about our plan in detail here: www.DCI.org/chase. Given the mechanics of the Chase Community Giving Campaign and how voting takes place through the popular Facebook social networking platform, we have the collective capacity to join together to significantly alter the course of performing arts education for years to come! Our best chance to make this happen is to unify, mobilize our friends and supporters, and vote! We'll all be winners in a BIG way! DRUM CORPS INTERNATIONAL as well as the BLUE DEVILS, GLASSMEN, SANTA CLARA VANGUARD, YEA! and partners MUSIC FOR ALL, MENC and WGI! Simply stated ... VOTE! And please get your friends to passionately support this effort as well. There are many worthy non-profit organizations that will be activating their supporters to assist in this campaign as there is obviously much at stake. Please join us in standing together in this unprecedented effort for the future of drum corps and performing arts education. Help us to keep the music marching on in our communities, and to change the course of our history, while working to preserve our legacy. Thanks in advance for your support and for sharing your passion with our community. We hope to see you in just a few short weeks, as the organizations which comprise Drum Corps International begin another spectacular summer tour. 1. Go to Facebook.com/ChaseCommunityGiving and "like" the page. 2. Search "Drum Corps International" or link to our page directly. 3. Cast your vote and encourage your friends to do so as well!